This vanity is a great way to add traditional style to your bathroom. The white marble counter and brown solid wood base make a beautiful look in your bathroom. With drawers and double-door cabinet, this vanity set is also great to keep items in. This classic set from Wyndham Collection will make your bathroom look brand new. For some added modern style in your bathroom, choose this beautiful vanity. Its beautiful white acrylic counter and brown fiberboard base bring a great new look into your bathroom. This set from Fresca is great for anyone looking for great style and function in their bathroom. If you want a vanity that is both stylish and useful, this modern vanity is perfect. With a white acrylic counter and brown fiberboard base, this product is good-looking and useful. Add a classic feel to your bathroom with this simple vanity set from Fresca. This vanity has both an all-around look and a modern style. This piece comes with a beautiful brown particle board base and a white ceramic counter. Make your bathroom look like new with this good-looking, useful set from GLACIER BAY. Berkeley 36-inch W 5-Drawer 2-Door Freestanding Vanity in Brown With Marble Top in White This vanity is a great way to add traditional style to your bathroom. The white marble counter and brown solid wood base make a beautiful look in your bathroom. With drawers and double-door cabinet, this vanity set is also great to keep items in. This classic set from Wyndham Collection will make your bathroom look brand new. 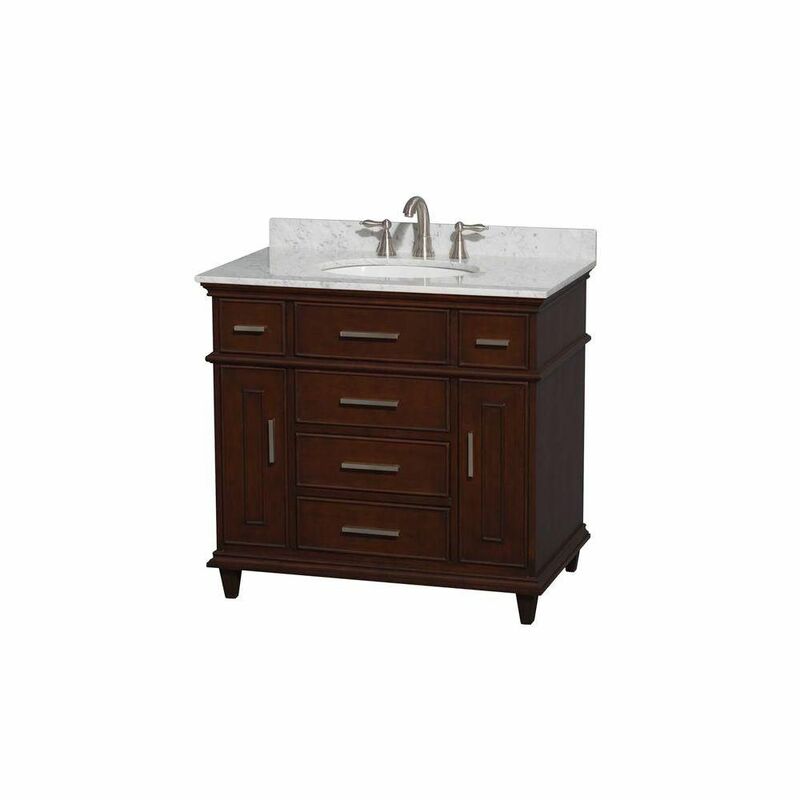 Berkeley 36-inch W 5-Drawer 2-Door Freestanding Vanity in Brown With Marble Top in White is rated 4.6 out of 5 by 5. Rated 3 out of 5 by JuanValdez from The good: solid construction with no MDF. Appears to... The good: solid construction with no MDF. Appears to be made of birch and birch? plywood. Hardware is good. Marble and sink are both nice.The bad: the finish quality is only ok. There are areas where the finish is uneven. This allows the natural light birch color to show through. Rated 5 out of 5 by Reggie from Beautiful piece of furniture. Packaged very well....not a scratch... Beautiful piece of furniture. Packaged very well....not a scratch on it. Adds elegance to the bathroom. Rated 5 out of 5 by Brian from VERY NICE QUALITY Very impressed with the quality of this vanity and top. Came packed in two separate containers, vanity in a double cardboard box and the marble top in a wooden crate. Rated 5 out of 5 by brian from Extremely impressed Very impressed with the quality of this vanity, build very well, finish was flawless and the packing was the best I have ever seen. I highly recommend this product line. Rated 5 out of 5 by Lucy from Well made, solid. Love it! Well made, solid. Love it!